I guess that one of the compulsory musical tracks that need to be listened to if you were to join the Imperial Army when Emperor Palpatine and his trusted right hand man, Darth Vader, ruled the universe, would be the Imperial March. If that is the case, then what better way to listen to such an awe-inspiring piece of music than with the Darth Vader DJ Stereo Headphones? Boasting 40mm thumping power drivers that has the Dark Lord of the Sith himself being “attached” on the side of each headphone, you will also have the Empire insignia printed on the soft pliable headband to show to the world, nay, galaxy just which faction you are rooting for. The headphones itself will be black in color – no questions about it, sporting a 75″ long insulated cord, and will play nice with smartphones, MP3 players and other devices that rely on a 3.5mm port. 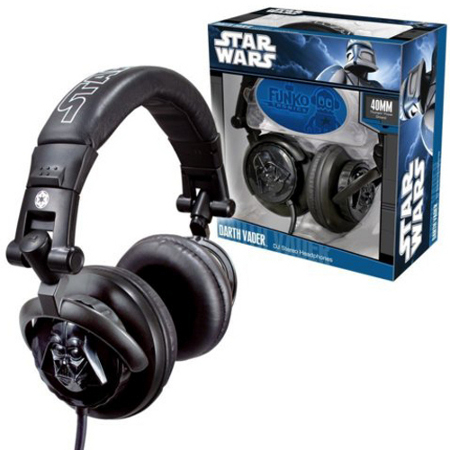 It won’t cost you any Republic credits for the Darth Vader DJ Stereo Headphones, but rather, you will have to part with $49.99 to get this, you Star Wars fanboy. We got these at Fry’s for 25$ and they have really good sound.